On June 23 & 24, check out the Cloverlodge Stampede, held just north of the golf course. With many kids activities, this outstanding rodeo has been running for 39 years. 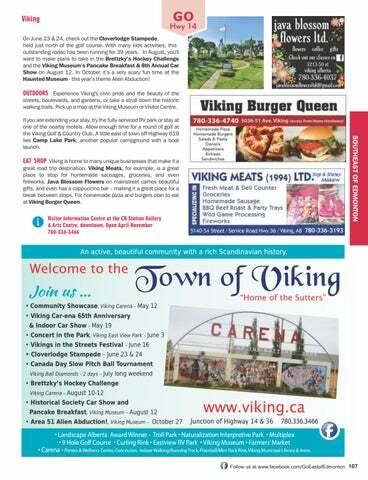 In August, you'll want to make plans to take in the Brettzky’s Hockey Challenge and the Viking Museum’s Pancake Breakfast & 8th Annual Car Show on August 12. In October it’s a very scary fun time at the Haunted Museum - this year’s theme Alien Abduction! OUTDOORS Experience Viking's civic pride and the beauty of the streets, boulevards, and gardens, or take a stroll down the historic walking trails. Pick up a map at the Viking Museum or Visitor Centre. If you are extending your stay, try the fully-serviced RV park or stay at one of the nearby motels. Allow enough time for a round of golf at the Viking Golf & Country Club. A little east of town off Highway 619 lies Camp Lake Park, another popular campground with a boat launch. An active, beautiful community with a rich Scandinavian history.